Theodore James (TJ) Wilson (born July 11, 1980) is a Canadian retired professional wrestler that currently works for the WWE as a producer, after retiring from in-ring competition in 2017. He is from Calgary, Alberta and was the final graduate of the famed Hart Dungeon. He competed in his first match with Stampede Wrestling in Calgary at the age of fifteen in 1995. In the WWE, he was a former member of the wrestling stable, The Hart Dynasty along with David Hart Smith and Natalya. He married Natalya in June 2013. On June 7, 2015, it was announced that Kidd suffered a severe neck and spinal injury in a dark match with Samoa Joe on Raw. Kidd announced that he would be out for over a year. Kidd tweeted that 5% of people are able to survive his injury and that he had 16 staples, 4 screws and a rod inserted in his neck. Dave Meltzer of the Wrestling Observer Newsletter said "It is unbelievable that Tyson Kidd came through as well as he did", and said that most people who survive the injury end up being a quadriplegic. 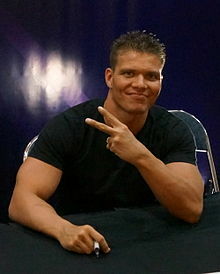 ↑ "Tyson Kidd Profile". Online World of Wrestling. Retrieved 2008-05-02. ↑ "Natalya and Tyson Kidd are married". WWE. Retrieved 2013-08-05. Wikimedia Commons has media related to TJ Wilson. This page was last changed on 9 August 2017, at 08:48.